Heat oven to 375°F (190°C). Lightly spray 13x9-inch (3 quart) (33x23 cm) rectangular baking dish with cooking spray; set aside. In baking dish, mix chili with hot dogs. Top with shredded Cheddar cheese. Open 2 cans Pillsbury™ refrigerated Country Biscuits; separate into 20 biscuits, and cut each into 4 pieces. Place in large bowl; toss with melted butter, garlic powder and parsley flakes. 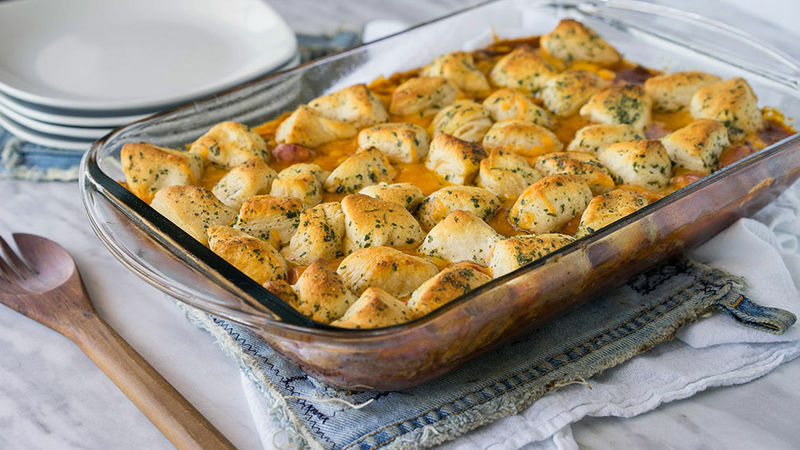 Scatter biscuits on top of casserole. Bake 20 to 22 minutes or until biscuits are light golden brown and cooked through. Let stand 5 minutes before serving. Serve this comforting casserole with a side of freshly steamed green beans. Variation: Boost the dish by adding 1 diced green bell pepper to the chili before baking.